Two men died following a car accident on the Cornelia Ida Public Road, West Coast Demerara on Tuesday night. 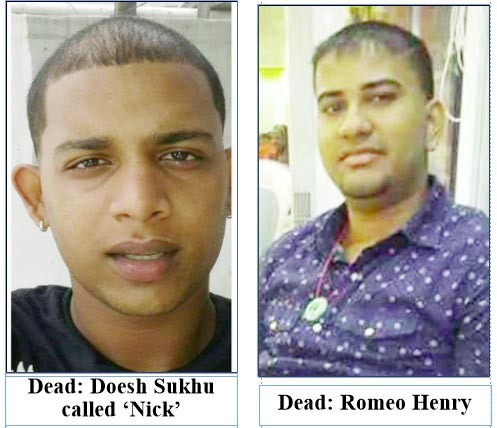 Dead are 26-year-old Doesh Sukhu called ‘Nick’ of Lot 15 Gap Road, La Jalousie and 26-year-old Romeo Henry of Lot 20 Second Street, Windsor Forest, West Coast Demerara. Another man, Rajendra Nandlall, 29, of Lot 58 Third Street, La Jalousie was treated for minor injuries and sent home. The driver of the car, a 25-year-old resident of Pakistan Street, La Jalousie remains a patient under guard at the Woodlands Hospital. 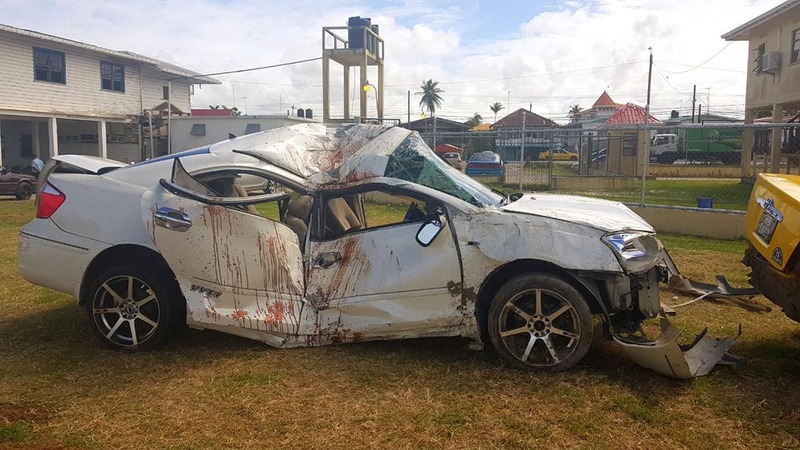 Investigations reveal that the men were travelling in a Toyota Premio PSS 413 driven by the unnamed La Jalousie resident who was said to be speeding along the road in an intoxicated state when the accident occurred. It was noted that the car was proceeding east along the northern carriage way of the public road when the driver reportedly lost control of the vehicle, causing it to collide with a fence and then a lamp post before it finally came to a halt in a yard on the northern side of the road. The car in which the men were travelling at the time of the accident. The driver, along with the other occupants of the car were rushed to the West Demerara Regional Hospital where Henry and Sukhu were pronounced dead on arrival. Stabroek News understands that a breathalyzer test was administered to the driver, the results of which indicated that he was above the legal limit. Nevertheless, he was kept for observation before being transferred to the Woodlands Hospital where he was admitted under guard. Krishna Henry, father of Romeo Henry told this newspaper that he last saw his son alive just after 1 on Tuesday afternoon when he came home for lunch, after which he left home to return to the shop where he worked as a barber, a short distance away. The father noted that he next saw his son on a bed at the West Demerara Regional Hospital later that night. Henry said that based on his observations, his son, who was already pronounced dead, had suffered injuries to his head and upper body. The senior Henry said that he does not know where his son was coming from when the accident occurred but that he assumed he was coming home. In addition to his father, the dead man leaves to mourn an eight-month-old baby, his wife, mother and sister. 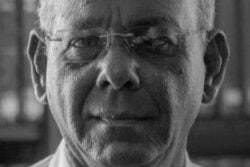 And like the senior Henry, Paul Persaud Sukhu is now left to mourn the death of his only son, Doesh Sukhu, a farmer who worked on the West Coast. 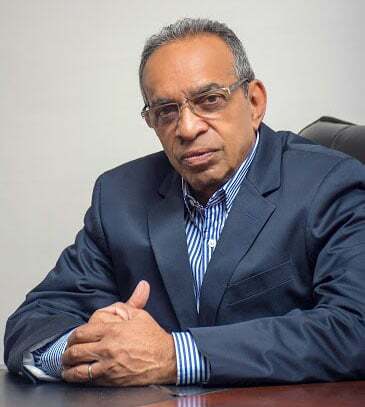 A teary-eyed Sukhu told Stabroek News that the last time he saw his son was when he left the house on Tuesday afternoon to go to what he assumed was cricket practice as he usually would in the afternoons. Sukhu said he was later informed by his neighbours that his son was involved in an accident after someone called and told them. This prompted him to visit the West Demerara Hospital where it was confirmed that his son was killed in the accident. Like Henry, Sukhu said his son suffered injuries to his head and neck. Sukhu leaves to mourn his father and sister. The wrecked vehicle has been impounded at the Leonora Police Station as investigations into the matter continue.